MAXIM Integrated Products, represented by Arrow Electronics , has introduced the MAX9765/MAX9766/MAX9767 family of integrated audio amplifiers, which are optimised for portable applications such as PDAs and cell phones. This family offers a complete audio solution by combining a 750mW bridge-tied load (BTL) speaker amplifier, stereo headphone amplifier, mic preamps, and input multiplexing in a tiny 32-pin QFN package (5mm x 5mm x 0.8mm). 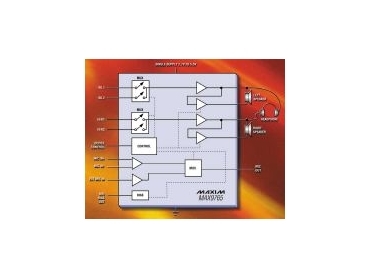 These devices operate from a single 2.7V to 5.5V supply and feature high 95dB PSRR, allowing operation from noisy supplies without additional power conditioning. Ultra-low 0.003% THD + N ensures clean, low-distortion amplification of the audio signal. A comprehensive microphone preamp offers differential and single-ended inputs, programmable-gain, and an integrated low-noise bias. Patented click-and-pop suppression eliminates audible transients on power and shutdown cycles. Power-saving features include a low 10mV offset voltage to minimise dc current drain through the speakers, a low 12mA supply current, and a 10 microamps shutdown mode. A headphone-sense input automatically configures the amps for either speaker mode or headphone mode by detecting the presence of a headphone jack. The integrated 2:1 input multiplexer makes it easy to select from multiple audio sources. Features include a stereo 750mW speaker amp, headphone amp, and mux with I2C control (MAX9765); a mono 700mW speaker amp, stereo headphone amp, and mux with I2C control (MAX9766); and a stereo 700mW audio amplifier with parallel control (MAX9767). All devices include a mic preamp, have thermal and short-circuit protection, and are specified over the extended -40°C to +85°C temperature range.